Please send me a price for the UP-4743-FP-3Rod67Lbs 47x43 used plastic pallet. Equal to the 1200x1100mm Euro export pallet the equivalent US dimensions for this pallet are 47" in length and 43" in width. The cross-bottom cruciform base of the 6 runner UP-4743-FP-3Rod67Lbs plastic pallet is a good match for block stacking. This stackable plastic pallet has a strong 6 runner bottom deck for safe double stacking of multiple plastic pallets with product. This rackable plastic pallet works in warehouse racking systems by using support from the 6 runner style bottom deck. Our used UP-4743-FP-3Rod67Lbs plastic pallet offers the expected reliability and quality of long lasting plastic at used pallet prices. 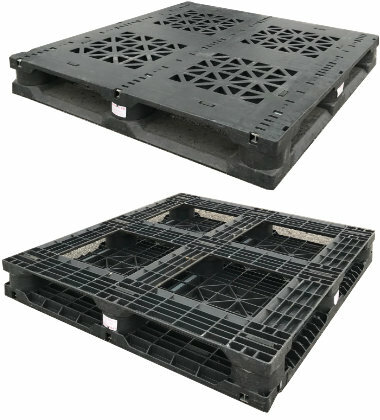 Plastic pallets like the UP-4743-FP-3Rod67Lbs are lightweight and durable. Its uniform length and width provide ease of use and safety. A lower cost plastic pallet like the UP-4743-FP-3Rod67Lbs lets you ship it out and erase the fiscal worry that comes with pallets not coming back. One-way plastic pallets like the UP-4743-FP-3Rod67Lbs let you send it and forget it making this a competitive alternative to pallet return options. Get more turns using the UP-4743-FP-3Rod67Lbs multi-trip plastic pallet and easily win back startup costs with durable and reliable plastic. Use the UP-4743-FP-3Rod67Lbs captive plastic pallet in closed loops to satisfy in-house reusability requirements with the reliability of plastic. Supporting 5,000 lbs of dynamic load when moved by a forklift or hand jack, this pallet works well in heavy duty applications. Note: color may vary per order but most are gray-black. *Not all used pallet load capacities are available and some may have changed since originally purchased. Specific unit load Sample Tests (ST) are recommended to insure successful use with specific applications and equipment. We reserve the right to change any stated information without prior notice. Not responsible for typographical errors. All used pallets have been inspected and cleaned. Pallets may have limited cosmetic damage, but all are structurally sound. Is the UP-4743-FP-3Rod67Lbs the right pallet for you?